My Typo Humour: Printing error, NI Water? Come off it. 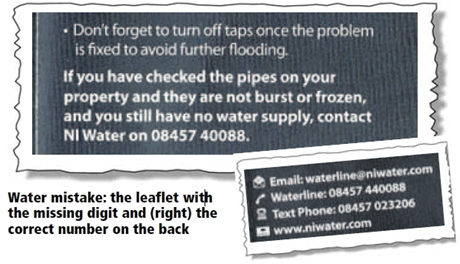 Shame on you, Northern Ireland Water, for blaming your mistake on a printing error. The picture and text below are taken from an article which appeared in the Belfast Telegraph on 27 October. Northern Ireland Water is facing another embarrassing blunder after a misprint of its helpline number appeared on leaflets sent to thousands of homes across Northern Ireland. The new leaflet from the water agency, which provides information about protecting pipes from freezing during the winter, has already caused confusion among some householders trying to ring the helpline. It provides information on how to protect pipes from freezing, and what to do if your pipes freeze or burst, and forms part of NI Water’s public winter awareness campaign. Part of the advice is a contact number for its emergency line. The number given on the inside of the leaflet is missing a digit, and householders trying to use it are met with only a dead line. A correct version of the helpline number is printed on the back of the flyer. NI Water has admitted the blunder, but said it won’t be re-issuing the leaflets. In a statement issued to the Belfast Telegraph, NI Water said the mistake was a 'printing error'. 'This error has been quickly corrected at no extra cost,' it said. For the record, the printer (read that as both person and machine) prints only what is set, proofed, read, approved and sent. What you meant to say, NI Water, is that someone that works for you, either directly or as an agent, made a mistake. Not that the mistake was a printing error. But you're a corporate. Therefore you naturally pick some anonymous person or machine to blame rather than admitting responsibility yourself. Pah! But the responsibility for content lies fairly and squarely on the customer or the customer's agent who signs off the final proof. How many times have we heard " but I only checked the layout, not the spelling"?